As we enter summer in Australia, it’s important to remember that while humans can usually keep cool indoors, pets cannot always escape the heat with their fur coats and their naturally higher body temperature. Here are some tips to avoid heatstroke and help make summer be more enjoyable for your pet! Always have fresh, cool water available for your dog to drink, in the shade, preferably at least 2 bowls/buckets in case one gets knocked over or becomes hot. Try tying them to something to prevent them being tipped over as many dogs will splash and dig at the water to get cool. Make sure your dog has access to shaded areas so it can escape the sun and avoid sun burn. Put up extra tarps or covers if you don’t have a lot of existing shade or get several large sun hardened pot plants and make a little “forest”. Only exercise early morning or late evenings, and take water with you. Areas with grass or dirt are preferable to concrete or cement pavement – remember that concrete holds heat for hours! Water play and swimming are ideal, if you have no natural areas like a dam or beach, consider letting your dog use the pool (if you have one) for exercise. I have let my dogs use the pool for years and the only thing my pool guy said was needed was to put a stocking over the filter to prevent dog hair from getting into the pump! You can play fetch in the pool for ages without your dog ever overheating! Depending on the breed and coat of your dog, it may be beneficial to look into getting your dog shaved. This works very well in humid areas, as the heat tends to get trapped and needs to be “let out” e.g. in places like Cairns and Brisbane, when it’s hot everyone opens the windows. In dry heat, long coats tend to insulate and “keep the heat out” e.g. in Adelaide and Canberra you close the windows and curtains to keep the heat out. Experiment and see what works for your situation. My long haired border collies coped with 35 degrees in Adelaide but I had to shave them in Cairns for them to be happy, one in particular. Provide a fan (the ones with safety guards that sit on the ground as ideal as the dog can lay close to get the full evaporative effect on their tongue) and/or a child’s wading pool (you can get hardy plastic shell pools for about $20 from Bunnings or toy shops). If you can, allow your dog into your house to access air-conditioning or fans whenever possible (baby gates can be very useful in limiting a dog’s movements inside to a hallway or laundry etc). Frozen treats help cool a dog down very effectively as they regulate heat through their mouth! Some great ideas are to freeze bones/biscuits inside a snap lock bag of water to make doggie ice blocks, freezing chicken or beef stock into ice cubes or takeaway containers, cold/frozen carrots, freeze water bowls halfway and then top up before putting out, or simply add ice cubes to their water. Never ever leave your dog in a hot car even for a very short amount of time, cars become ovens far too quickly to risk it. 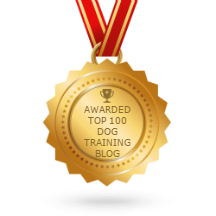 SitDropStay are leaders in dog obedience training. Discover the difference we can make to your pet, simply call us today!